Peter Williams/Museum Services specializes in the conservation and restoration of 19th and early 20th century American and European oil paintings, murals and picture frames. Peter Williams, founder of the company, has a special expertise and interest in maritime paintings. We have been located in the historic Fenway Studios building in Boston since 1974 and enjoy an outstanding reputation for quality, service and integrity, while serving major art galleries, auction houses and collectors and museums in New England and beyond. We also work for insurance companies and universities. A reviewer has mentioned that we are more reasonably priced than some others in our field. We treat scores of paintings each year for satisfied clients who are not affiliated with with an illustrious museum or institution. Our art restoration and conservation clients include the Boston Symphony Orchestra, the Massachusetts Historical Society, the Boston Public Library, the Massachusetts Institute of Technology, the Redwood Library and Athenaeum in Newport RI, the Newport Historical Society, Faneuil Hall, Newport Art Museum, Harvard Club of Boston, Providence Art Club, St. Mark's School, St. George's School, Grand Masonic Lodge Boston, John F. Kennedy Presidential Library, the Gilbert Stuart birthplace in Smithfield RI, Rhode Island State House, Gloucester City Hall, Gloucester MA, Boston University, and two United States Senators. We offer service to clients covering the Continental USA. Although we have served Admirals and Ambassadors, our services are available to anyone by appointment. In 1972, Peter Williams/Museum Services began in the enclosed porch of an antique house on theSouth Shore of Boston. 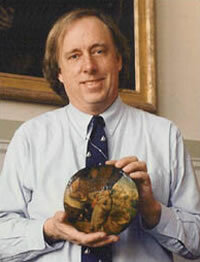 The firm was founded by Peter Williams, a former object conservator who hadworked in the Research Laboratory of the Museum of Fine Arts in Boston. 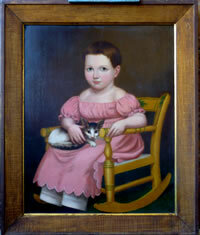 During the first year ofbusiness the company restored objects for the John F. Kennedy Presidential Museum and Library,paintings for the Minnesota Bicentennial Exhibition, and a ship portrait for Vesterheim, theNorwegian-American Museum in Decorah, Iowa, which had been given to the museum by the King of Norway. In 1974, the firm moved to the historic Fenway Studios building in Boston, a National Historic Landmark. Since 1905, this “artistic beehive” has been the center of the “Boston School” of painting. In 1977 Jacquelyn Trombley, joined the firm and is now Senior Conservator. Over a period of years she has gained the rare and valuable experience of restoring paintings by many of the finest artists who have worked in our country from the colonial period into the early 20th century. Stephanie Holloway was hired in 2003 as a skilled in-painter and now plays an essential role in conservation issues and technical communications. Marjorie Sagan is our able Office Manager. Gifted Painter, Camera Obscura crafter and Puppet Maker David Lowrey is our frame carver and sculptor. Founder Peter Williams has recently been featured on popular WGBH television programs Chronicle and Jared Bowen's Open Studio . He has also restored a painting seen on Antiques Roadshow which is presently on exhibition at the Peabody-Essex Museum in Salem Massachusetts. Peter Williams/Museum Services is a member of the New England Museum Association. Peter Williams holds a painting by Pieter Brueghel The Younger, 1565-1637. The painting was restored on short notice so it might be included in an auction at Christies, London.